Converting your garage into a workshop can seem like a dream come true. 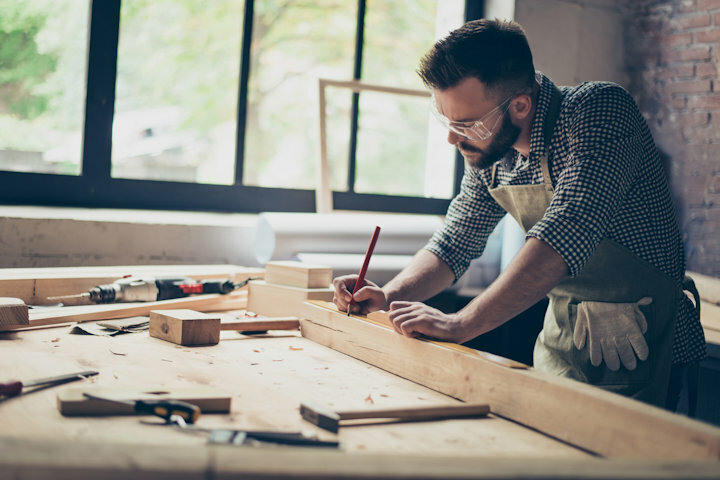 It’s easy enough to work in your garage, but to truly turn it into a dedicated space for your woodworking requires a little bit of thought and effort. Take the following questions into consideration when embarking on a project to convert your garage space from the storage area to a fully functional woodshop. Does your garage have adequate ventilation? If not, you’ll need to figure out how to make sure you’re not breathing in copious amounts of sawdust or hazardous fumes from stains, sealants and other chemicals used on your projects. Depending on the size of your garage, it may be as simple as adding a vent fan to an existing window or as complex as installing a whole new ductwork system. If you do nothing else to convert your garage into a woodworking shop, this should be it. When you’re working with wood, you need to be able to see what you’re doing. Usually, garage lighting is adequate for basic, general tasks. It’s environmental or ambient lighting. Consider upgrading your garage lighting when converting it into a shop – or adding task lighting near your workbench and tool storage so you have a better view of your projects. Not only will you avoid eye strain and fatigue, but you’ll improve the safety of your shop, too. Dedicated lighting in these areas is a must when converting a garage into a woodworking workspace. What’s your Security Look Like? A workshop isn’t just a place to work on your projects — you’ll also be storing some valuable equipment and materials there. Therefore, you might need to beef up the security on your garage. If you’ve got a large door that opens to the street, you’ll want to focus on keeping that closed. For example, a locking latch system would be an excellent addition to a car-sized garage door. If your neighborhood is less than ideal, an alarm or even motion sensor lights or cameras might be advisable, in order to ensure your shop remains safe from would-be thieves. While most people don’t consider the security of their garage-turned-workspace, it’s a must-have. Power tools are great – even if you primarily work with hand tools, there’s a good chance at least some of your equipment needs to be plugged in. If your outlet situation is less than stellar, you’ll probably need to wire in some new receptacles or hire an electrician to outfit your garage for use as a workshop. Heat, humidity and freezing temperatures do a number on wood, sure, but they also don’t make for ideal working conditions when you’re shaping that wood. If your garage lacks insulation, now might be the time to add it. Consider what your new workspace will feel like in the height of summer or the dead of winter. If necessary, install a heating or cooling system to mitigate the worst of it. If you’ll be storing extra materials in your workshop, consider a dehumidifier to keep your wood from swelling. Converting your garage into a workshop can be done on a budget, but you need to have the essentials to work comfortably and safely. Appropriate outlets in the right spots, adequate lighting, proper ventilation, security to keep your tools and equipment safe and some source of climate control are really just the essential features to turn your garage from an occasional project space to a full-time workspace.